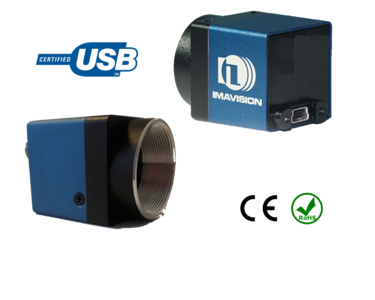 The Mercury USB2.0 camera series is an industrial vision camera, with an USB2.0 interface. 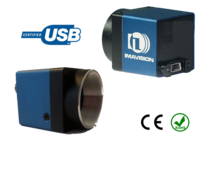 USB2.0 is the most price competitive interface regarding industrial machine vision cameras. If more details are required, the manual can be consulted. A black and white camera, also known as a monochrome camera, offers advantages in a variety of applications. While the market for security and telephony focusses on color cameras, the industrial market utilizes the advantages of black and white cameras. Black and white cameras are very light sensitive, provide sharp images and reduces data compared to color. This makes it ideal for the processing of images. By selecting the right color as your light source and lens filter, a black and white camera can utilize the product its characteristics. Hereby men can create images with a large contrast and a high resolution. Most applications do not require I/O. Applications that need a software trigger or need continuous imaging, do not need I/O. The USB port of a PC provides both power and data communication to the camera. If a I/O connector is not being implemented, both the material costs and development time will be reduced. The result is that L-version cameras are cheaper than the standard USB camera version. Programmable Controls: Gain, frame rate, frame size .Applications: Digital still cameras, Digital video cameras, PC cameras. General Description: The ON Semiconductor MT9M001 is an SXGA-format with a 1/2-inch CMOS active-pixel digital image sensor. The active imaging pixel array of 1,280H x 1,024V. It incorporates sophisticated camera functions on-chip such as windowing, column and row skip mode, and snapshot mode. It is programmable through a simple two-wire serial interface. This megapixel CMOS image sensor features ON Semiconductor’s breakthrough low-noise CMOS imaging technology that achieves CCD image quality (based on signal-to-noise ratio and low-light sensitivity) while maintaining the inherent size, cost, and integration advantages of CMOS. The valuation of www.get-cameras.com at Valued Shops reviews is 9.5/10 based on 31 reviews.